• Benefitting from the specially ground dual-relief insert and optimized coating, higher feed rates and cutting speeds can be achieved on chamfering operations. 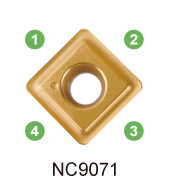 • Each insert has 4 cutting edges, reducing cost of inserts. • Fine edge honning cutting edge, good chip breaking condition and long tool life. • Elliptical necked bar to optimize the tool strength. • Shank is ground to h6 tolerance. • Cmin. Ø6.8mm - Cmax. Ø13.2mm. Made from hot working steel and hardened. 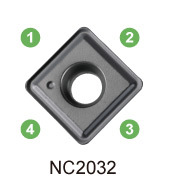 NC2032 : For carbon steel, alloy steel, cast iron and hardened steel up to 56HRC. NC9071 : For no ferrous metal. Sharp cutting edge, excellent surface finish.